Stahmann Farms technical officer Miriam Villen-Rodriguez, left, Northern Tablelands MP Adam, Stahmann employee Tristan Grant, CEO Ross Burling, Phillip Turner, Federal Parkes MP Mark Coulton and Stuart Boughton discussing the $51,000 grant this morning at the Trawalla property. TWO agricultural enterprises near Moree will add another 16-17 staff after receiving more than $200,000 from the State’s Murray Darling Basin Economic Diversification Program. 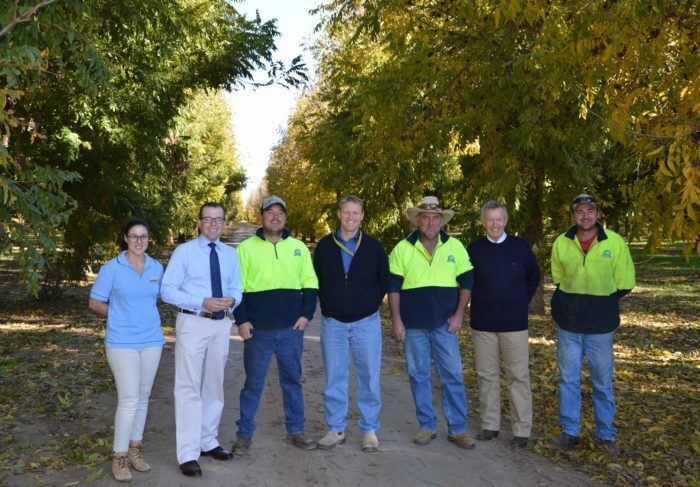 The funding was announced today by local MP Adam Marshall and Federal Member for Parkes Mark Coulton at Stahmann Pecan Farm, near Pallamallawa. Stahmann Farms received $51,000 to support an expansion of its orchard, backed with a solar-powered irrigation system. The other recipient, Grove Fruit Juice, will use its $150,000 grant to also expand its orange orchard near Moree. “Both these enterprises are outstanding examples of agricultural diversification and intensification in the Gwydir Valley,” Mr Marshall said. The funding is being delivered as part of a program to offset the economic effects of the Murray Darling Basin Plan. By re-allocating water from irrigators to the environment, the Plan is estimated to have cut about $60 million from the economies of north-west irrigation towns. “These grants don’t make up for the loss of water, but they support enterprises that use water for high-value products,” Mr Marshall said. Mr Coulton agreed that it is important to support projects “that make best use of our precious water”. “Our local farmers are very innovative and forward thinking,” Mr Coulton said. Stahmann Farms, which produces 80 per cent of the pecans eaten in Australia and also exports to Asia, plans to expand its existing pecan orchard by 110 hectares (22,000 trees) and irrigate them using a solar-powered high pressure drip system. Grove Juice intends to develop another 80 hectare orchard (39,000 trees) to complement the 217 hectares of oranges already in production, and install a drip irrigation system to ensure the most efficient use of water.